The FreeStyle Lite blood glucose meter is small and discreet. The FreeStyle Lite system allows you to manage your blood glucose by offering features such as no coding, the smallest blood sample size, a back light and a test strip port light. The FreeStyle Lite glucose meter also allows you to use Alternate Site Testing on the fingertips, forearms, upper arms, thighs, calves, and hands. However, it is best to consult your health care provider for acceptable sites for your testing needs. 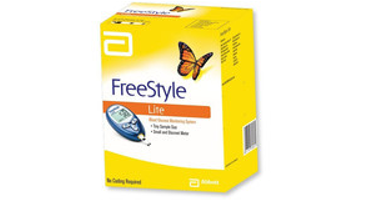 Abbott FreeStyle Lite Blood Glucose Monitoring System is compatible with Abbott FreeStyle Lite Blood Glucose test strips.